Five fun facts you need to know! 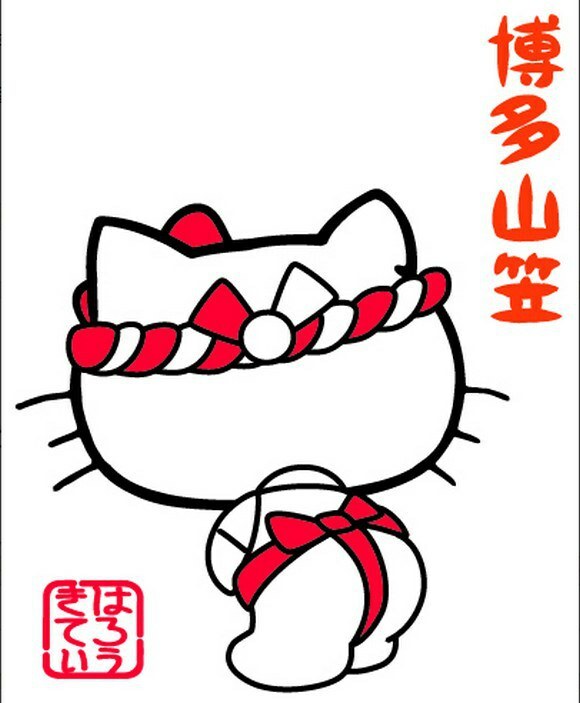 一 The festival originated over 750 years ago and is linked to a Buddhist priest and all round top guy called Shoichi Kokushi. It is said he travelled through medieval Hakata, elevated on a platform, sprinkling blessed water hither and thither in an attempt to eradicate disease. This became an annual ceremony, and even today water is thrown by the crowd in honour of this healing practice. 三 There are two different kinds of floats; the almighty kazariyama are adorned with a vibrant, multicoloured selection of mythical beasts, monsters and nowadays even anime characters. Originally used for hurtling around at break neck speeds, low hanging electricity cables rendered this rather impractical so now the kazariyama are mostly used for display, whilst smaller kakiyama have now taken over the racing aspect. 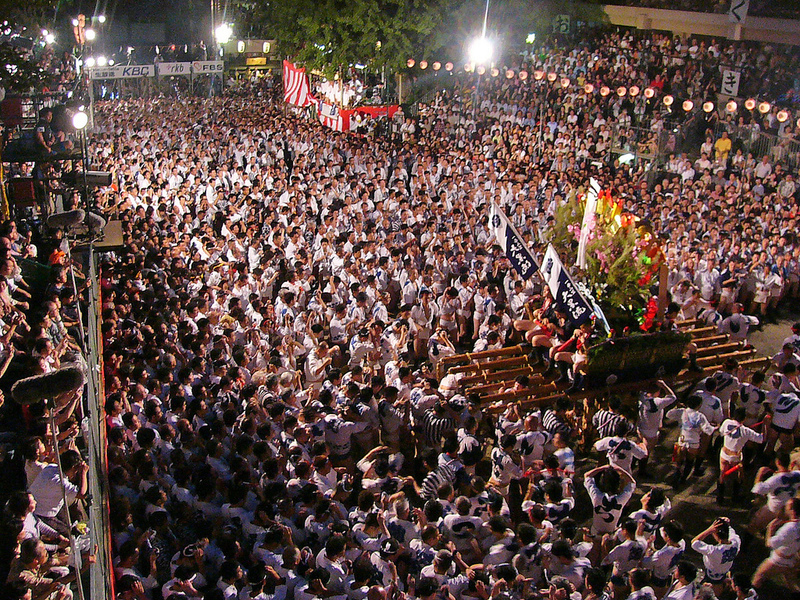 四 The festival reaches a giddy climax with the Oiyama Race, taking place at 4.59 AM on July 15th. 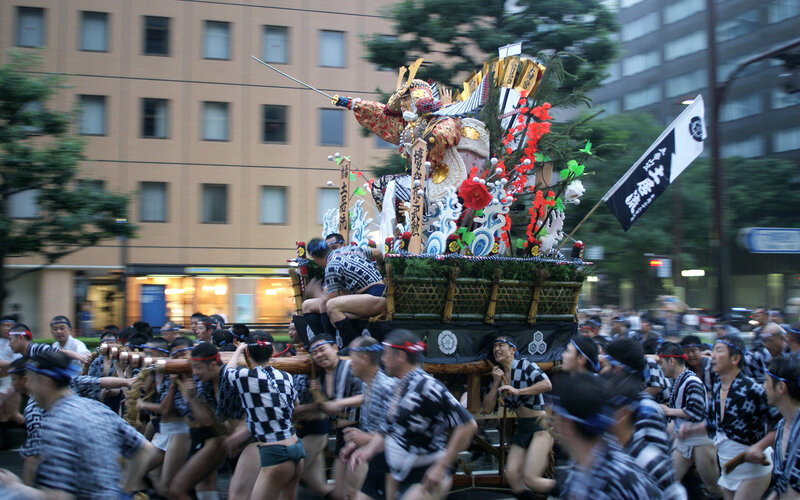 Here, seven teams representing the seven districts of Hakata race their floats through the city streets. Over thirty men on each team help carry the load, run alongside or shout words of encouragement. The 5km race incorporates an invigorating song at the famous Kushida Shrine, providing a real spectacle for the crowd. 五 The sound of the Hakata Gion Yamakasa is listed in the Top 100 Soundscapes of Japan. With the beat of the taiko drum, the din from the kakiyama floats and the roar of the crowd it’s not hard to see (or hear) why. This is one festival that is very much, shall we say, in our bones. Our CEO Tak Tokumine and Shoryu Ramen Head Chef Kanji Furukawa, both herald from the Fukuoka region and have cheered on the floats themselves. Not only that, but did you know that the Hakata residents refrain from eating cucumbers for the duration of the Hakata Gion Yamakasa? According to the Japan National Tourism Association: “Even if (Hakata residents) happen to find slices of cucumber in a bowl of salad, they will pick them out. This practice is said to derive from the fact that the pattern of the round cucumber slices resembles the emblem of the festive deity called Gion-sama enshrined in Kushida-jinja Shrine.” The more you know! 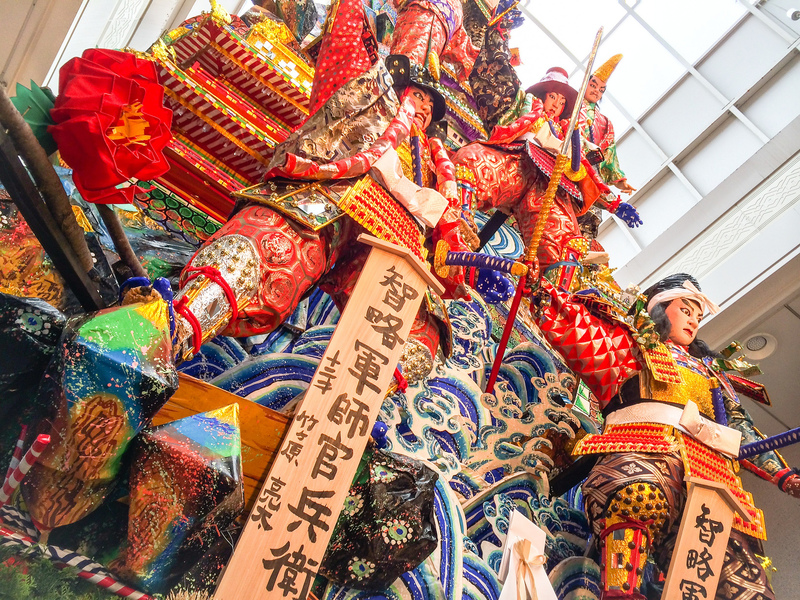 Are you lucky enough to be attending this year’s Hakata Gion Yamakasa? We’d love to see your pics on Twitter, Facebook and Instagram. Thanks to ville misaki, 4ruri, chikayoshi yamagasa, masanori shimojo, corey zwegers, junko hiramatsu, shin7d, chikayoshi yamagasa at flickr for the great images. Posted in Travel and tagged Fukuoka, Gion, Hakata, Hakata Gion Yamakasa, japan, Japanese festival. Bookmark the permalink. Such a beautiful city with such rich culture and food. My father and I have been visiting our Japanese family on occasion and we love it and can’t get enough of Fukuoka! My mother was born and raised in Fukuoka.